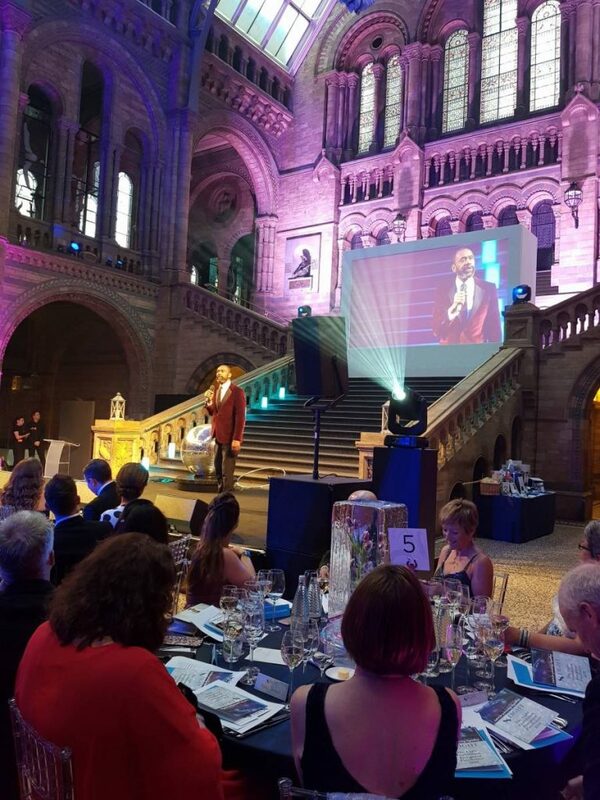 Eclipse was asked by a high-end client to produce a charity dinner at the Natural History Museum with the aim of making it ‘spectacular and memorable’. 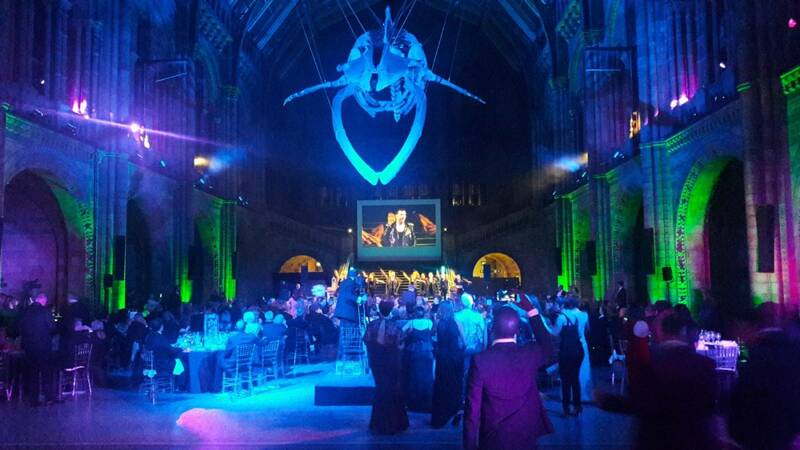 The event, hosted by a high-profile celebrity and national radio DJ, included a varied programme of entertainment which required us to build creative sets. As well as providing all AV support, Eclipse supplied custom-built risers to allow two ballerinas and a contortionist to perform at a raised height within the drinks reception area, and a large mirror ball on which the opening act performed. Logistically, there were other challenges: On the night itself we had just one hour to set up for the event. This is due to the fact the Natural History Museum is open to the public during the day, so access is only available from 6pm when it is shut and cleared. With the drinks reception scheduled to start at 7pm and the dinner at 8pm the Eclipse team had to act fast and not only set up equipment, but sound check multiple acts on stage within the hour before guests arrived. While challenging, Eclipse’s forward planning – equipment was tested, configured and pre-cabled as much as possible in the warehouse prior to going on-site – and thorough team briefing meant that the set-up went very smoothly with no stress. Eclipse proved that, even with specific requirements and obstacles to set up, anything is possible. 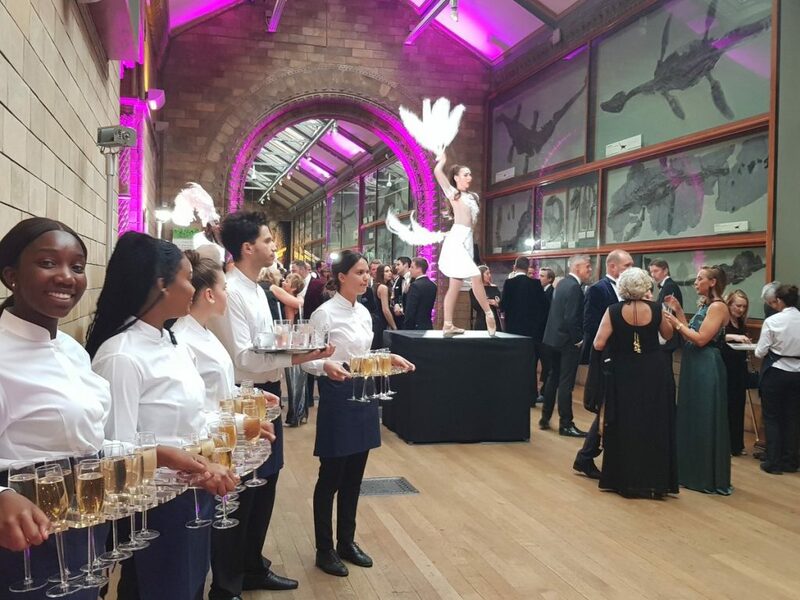 The event was a roaring success and all the guests had a whale of a time with great feedback from both the client and the venue who were impressed by our forward-planning and ‘spectacular’ approach.